I'm moving my photos from my old personal website to Flickr, seeing if it works better as a general photo album hosting site. The album organization features are better on Flickr, after the recent upgrades they've done, and the varying levels of photo permissions are very nice. I'm a bit concerned, though, that the need to sign in might be a bit much for a few of our computer-challenged relatives. We'll see how it works out. 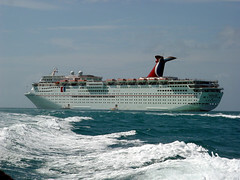 The attached photo is the cruise ship from our honeymoon.